All of us like to experience the proverbial Disney pixie dust (extra magic bestowed upon us by cast members). 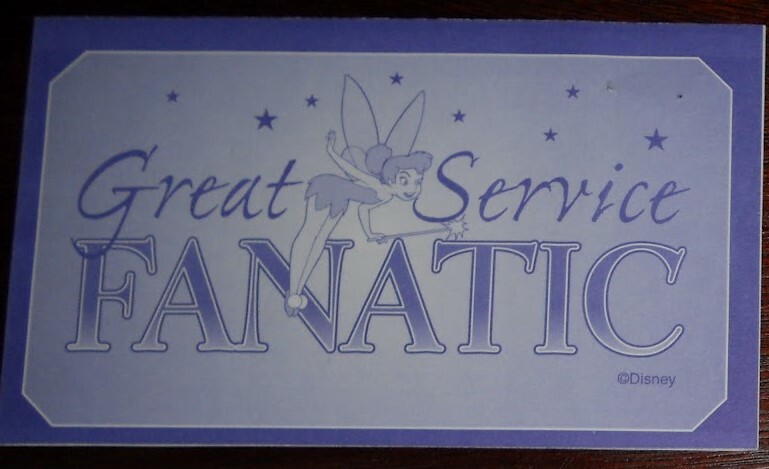 Whether it be free fastpasses, surprise celebration desert at your dinner meal, or even room upgrades; when cast members shower us with pixie dust it makes us feel special. Back at home we call these Random Acts of Kindness, or RAK for short. They are essentially the same thing. Bestowing on someone else a good deed, a gift, a kind word without expecting anything else in return. And so we got to wondering, if we are practicing RAK at home, why weren’t we doing it at Disney. Why do cast members get to have all the fun? Let us make our own pixie dust and spread it abundantly. After all, kindness is infectious. So here are 20 ways we like to spread pixie dust while in Disney. Tip Mousekeeping – Controversial, yes. Many feel tipping is not necessary for housekeepers. But RAK can be for anyone. Everyone deserves a smile in their day. It doesn’t have to be money. You can leave a nice note, a can of pop, or even sealed snacks. In the fall we usually leave some of our score from the Halloween party we attend. You can find some really cute templates on Pinterest for making your own envelopes too. Free Treats – Buy the person behind you in line a pop, Mickey bar, or popcorn. A free treat tastes even better! Free Meals – Once while walking through the Contemporary on our way to Chef Mickey’s for breakfast, a gentleman stopped us and asked if we were going to be in Disney a few more days. When we said yes, he handed us a Disney gift card. He was there on a business trip and leaving that morning. The card still had a hefty balance and it more than paid for our meal. It doesn’t have to be gift cards. You can just ask your waiter/waitress to help you pick up another table’s tab at any restaurant. We usually like to pick couples who are not on the dining plan. 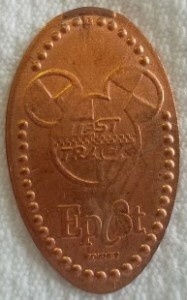 Pressed Pennies – Leave quarters and pennies in the pressed penny machines. The next person gets a free souvenir. Characters – Have your child draw pictures or write notes to their favorite characters. They can then give them to the character during a meet and greet. We have even seen a child present her favorite Princess with a flower. Compliment – With so much negativity these days, buck the system. Compliment a random parent on their child’s behavior. Compliment another guest on their creative Disney bounding outfit. Just say nice things and say them often. Line jumpers – Let someone go ahead of you in line. Is the family behind you trying to deal with a child about to have a melt down? Let them go before you. You can probably wait another two minutes for that hot dog, but the child may not be able to. Parking – Pay for the car behind you at the toll booth for parking. What a magical way to start the day! 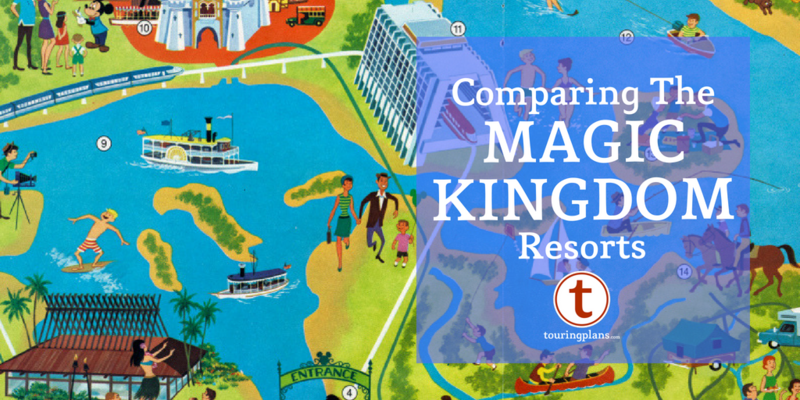 Buses and Boats, oh my – Give up your seat on the bus, boat, or monorail. Everyone is tired at the end of the day. But, anyone older than me should sit before me, anyone with small kids should sit before me. Not everyone has the stamina I have and I certainly hope that when the time comes that I can’t easily do an all day marathon, someone bestows the same pixie dust on me. Be that other hand – When families split up at quick service restaurants, it can leave one person to have to cart a large amount of food by themselves. Help carry a tray of food. Talk to Cast Members – Cast members are people too! They are not just there to serve you. They just happen to be at their place of employment. Ask about their day, where they are from, or simply say thank you. Sometimes it is just nice to interact and acknowledge they are there. Volunteer – At Disney? Technically no. We have volunteered at Give Kids the World which is only a short drive away. Four hours of your time may mean the world to a family who is going through a severe illness of one of their children. It is very rewarding to see their smiles. Some pre-planning is necessary. You must fill out an application and have a background check done. Visit their website for more details. Be a photographer – Offer to take pictures for couples or families. Every family member should be in the picture, and not everyone has Memory Maker. You will help capture a family memory they can cherish for years to come. Balloons – Buy a child a balloon. Or re-gift yours before you leave. Tokens of appreciation – Make small gifts to give to the cast members. Ornaments, Ellie badges, decorated Easter Eggs, or small sealed foods are acceptable. Money never is. During our last December trip we made small snowmen heads with hot cocoa packets, candy canes, and a thank you note on their hats which we passed out. Pass it on – For those of us who take our own bottled water, granola bars, and cereals it really is better to pass it on than carry it all back home. You can post online on one of the many social media outlets or Facebook groups what you have, which resort, and when you are leaving. Someone will surely offer to take it off your hands. All you then need to do is leave it at luggage check under their name. We once even were passed on an apartment sized refrigerator this way (back before they were standard in the room). 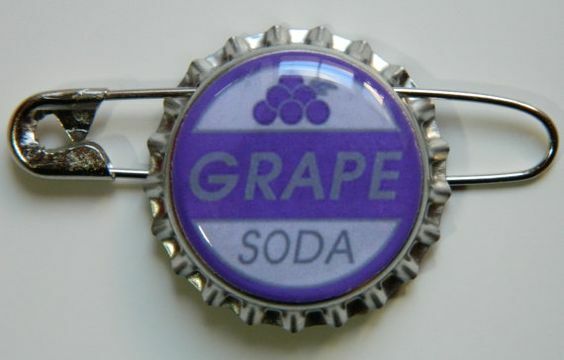 Trade pins – Look for the kids who are introverts. Make a big deal out of the pin they trade you. Stuffed animals – …or Mickeys, Stitches, or Olafs. Leave a new animal in a random stroller with a note about giving him a new home. Thank You notes – It is as simple as “Thank you for making our vacation magical”. Leave them with the bus driver or with the tip at dinner, hand them to the parade attendant, the Dapper Dans, or a maintenance worker, or give them to a ride attendant or to a character’s handler. Everyone likes to be appreciated. Be a Fanatic – During your day, take notes of any cast member who did an exceptional good job. Note their first name, the location you met them, the date, and the approximate time. 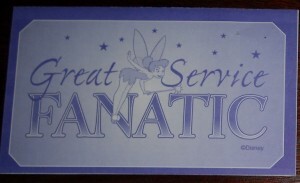 Then as you are leaving the park, stop by guest relations and fill out a Cast Member Fanatic Card. The cast member will then be officially recognized for their actions by their superior. Be sure to stop at Guest Relations! Have you ever been the recipient of another guest’s pixie dust? Do you practice spreading RAK while in Disney? Let us know in the comments. Part time blogger with a full time Disney obsession. Love researching, planning for, and visiting all things Walt. tipping housekeeping is controversial? what kind of savages dont tip the maids? im not super rich or anything but $5 per day seems like the minimum to me. I never thought of house keeping tipping controversial. I agree… Tip house keeping. We are spending how much for this vacation? Surely another $3 or $5 a day isn’t going to blow our budget, lol. Generally $1 to $2 a day per guest is appropriate, also consider if your room is extra messy. Smelly diapers, maybe cheerios spilled behind the bed? Yeah, leave a few bucks more. While WDW employees do enjoy a few perks, these positions normally pay around only $10/hour. With daily tipping, hopefully they can make closer to $15/hour. I agree, it’s not really of question of if, but how much! Adequate service requires a tip, great service requires and great tip! In my world, one only tips people who make below minimum wage, where their tips are expected to make up the difference. Since housekeepers do not make below minimum wage, there position is one for which tipping is not expected. Or at least shouldn’t be. I’ll tip them for service above and beyond their regular duties, but not for doing what they are already being paid to do. Do you tip your postman for delivering your mail everyday? Didn’t think so. We had a family give our daughter a little Minnie mouse as we walked through world showcase. She felt so special being picked out from all the people walking around. The family said each of their children gave one out on each day of their vacation, and that it was a tradition they picked up from someone that gave them a toy the same way. Next time we go it’s our plan to do the same. I miss the paper fast passes. My husband and one of my kids were afraid of some rides but I always got all 4 of our fast passes. I would find a couple of people staring up at the stand by time and give them the two not be used. Their smiles when they found they wouldn’t have to wait over an hour for Expedition Everest was awesome! You can request a Rider Swap and they still give you the paper FP slip valid for up to 3 people. We always have extra and get to give them away. They are valid for at least a couple of days usually. Please don’t buy my child a balloon. I don’t want to drag it around the park all day. You probably weren’t the first parent to cringe at the balloon. I don’t usually spend much time in the sun so I normally don’t need sunscreen and I never need after sun lotion. So when I checked out of my WDW resort, I gave the partially full bottles to the lifeguard at the pool. He said they love to have extra to give to guests at the pool. While in line for Expedition Everest, we noticed a group of young Japanese visitors. One of the girls had a small stuffed Stitch attached to her backpack. Being the huge Stitch fan he is, my husband asked her where she got it. She didn’t speak much English, but she removed the Stitch and handed it to my husband, saying “gift for you”. When we exited the ride, the Japanese group stopped to look at their on-ride photo. My husband motioned to the cast member that he was going to pay for their photo. Another cast member had seen this whole event, and invited all of us to the side, where he handed us “Pixie Dust” pins, for both of our kind acts! My husband treasures that Stitch and the Pixie Dust pins to this day! On our first trip to WDW with kids (3 years & 16 months at the time), we had booked a dinner in Cinderella’s Castle. Just as we were being shown to our table, I did my habitual “pocket check” and realized that I had forgotten my wallet in the safe back at our room. I had chosen not to attach a credit card to our tickets at the time because we were a young married couple with two small kids and not a lot of extra money. I thought ready access to credit in WDW would be a recipe for disaster. Our server worked feverishly with the staff at our hotel over the phone in an attempt to attach the credit card we had used to book our stay to our tickets, but it couldn’t be done. This meal was supposed to be the highlight of our trip, and I didn’t want my kids, in particular to miss it, so I left in a desperate attempt to try to get to the room and back with my wallet. I begged the server to please let my family stay until I got back. When I boarded the bus to our resort, I quietly told the bus driver what was happening and asked if he could please just wait at the resort bus stop when we arrived while I retrieved my wallet. I didn’t want to lose even more time waiting for the next bus. He said he just couldn’t do that. I sat down with what a know was a look panic and frustration at my own stupidity, resigning myself to a very, very long trip and knowing my family would be asked to leave long before I made it back. A moment later and before the bus had filled enough to leave the Magic Kingdom, a lady in the seat across from me touched me on the shoulder, held out $250 in cash, and asked if I thought that would be enough to cover our meal at Cinderella’s Castle! I was shocked. Normally, I wouldn’t have dreamed of accepting such an offer, but I was desperate. I asked for her room number and promised to pay her back. She said she wasn’t concerned whether or not I paid her back, she just wanted me to enjoy that special meal with my family. I ran off the bus and back to the castle to find my family just finishing their food. The chef had come out, told them to order, and was planning to cover the cost himself! The server gave me the opportunity to order a meal for myself and never once rushed us along to free up our table. It obviously wasn’t a relaxing meal. We didn’t even really get to eat together, but it was, without a doubt, the most magical dinner my family has ever had. That was 2002. We have returned to Disney World almost every year since then. The patience, kindness, and generosity of the server, the chef, and the lady on the bus are now indelibly associated with the most magical place on earth. How could we stay away? And in case you’re wondering. Yes, I paid the kind lady back later that night. I still have the little slip of paper upon which she wrote her name and room number stashed away in a drawer to remind me of the impact of one person’s kindness. I love this so much. Very magical! Not to be a negative Nelly here, but isn’t Cinderella’s Castle prepaid? And how come you didn’t take a cab back & forth to the hotel? If you wanted to be ask fast as possible and make it back for your dinner, that would seem to me to be the best thing to do. First, things have change a lot over the years. As I mentioned this was 2002. The meal was neither pre-paid nor a character meal at the time. I’m not even sure if the restaurant was called Cinderella’s Royal Table then. Second, we were essentially Disney nubies. I hadn’t read The Unoffical Guide, I didn’t even know there was one. I didn’t know you could take taxis. We’d been taking the buses the entire trip, and no other form of transportation even entered my mind. As my wife just reminded me, we’ve never even been in a cab. A cab just isn’t something we think about. Besides, how am I going to pay for a taxi? I didn’t have any money. Lastly, if, as it seems, you are insinuating that I’ve made up the story, well you’ll simply have to judge for yourself. But I can assure you that I have far better things to do with my time than sit around for hours thinking up some fairytale story for strangers to read. I read the article about ways to show others random acts of kindness and immediately thought of this event. So many people had been so kind to us in one short span of time. Perhaps you’ve never experienced such kindness from others and as a result you are a Negative Nelly. I don’t know. But now my happy memory is something less so. Thanks. Thanks, MG, Belinda, and Brundholme. We booked that trip in early 2002. Travel to WDW was in the tank because of 9/11, and our travel agent got us booked in a standard room at AKL for $99 a night! I knew nothing about AKL at the time, so I had no idea what that meant when the agent made us the offer. We arrived on either the Saturday or Sunday before Memorial Day, and because of over booking, or the time of our arrival, or both, we were given a DOUBLE UPGRADE to a savanna view room! So…our first ever family trip started with a double upgrade at AKL (morning coffee with the giraffes, anyone?) for $99 a night and ended with the story related above. Since then, we’ve had mostly good trips, a number of great trips, and probably three not-so-great trips. But it doesn’t matter. You know that saying, “you never get a second chance at a first impression?” Even when we’ve left the World frustrated at crowds or costs or inconsiderate people, the overwhelming affect of that first impression seems to push its way back to the top. I love these ideas, but I swear, people are so uptight and defensive at Disney. I do some of these things, and people look at me like I’m a potential serial killer just for talking to them. And I’m a relatively cute girl in her mid-20’s! I don’t understand it. But you know, if you don’t want that extra paper Fastpass the CM handed out that I don’t need because I’m about to park hop, that’s fine. And God forbid I offer to give your child my lei from the Poly while I’m resort hopping. That’s terrifying stuff right there. My youngest daughter was celebrating her 6th birthday at Disney World and having quite a magical day. We were walking through Frontierland when she spotted a small, handmade stuffed bunny. It had a tag attached that it was part of the Bunny Giving Project, where crafters made these tiny bunnies and left them in random places to be found. My daughter was truly delighted and still treasures her gift. My favorite is to send a drink over to someone celebrating their birthday/anniversary in a fine dining restaurant. Especially younger couples, who may not have room for a glass of champagne in their budget. When we were on a dinning plan that covered appetizer, entree and dessert. We’d always give one dessert to someone next to us and split ours. Love this article! Another thing that is really easy to do is to wish someone a happy birthday, happy anniversary, whatever, when they are wearing one of those pins. We are usually at Disney for my daughter’s birthday and pretty much every Cast Member that sees her will wish her a Happy Birthday, but it always puts a smile on her (and my) face when a stranger just wishes her a HB in passing in the parks. I took my best friend to WDW last October. She’s never been and it was only a weekend, so we only went to MK. I brought the glow bracelets and wands, and handed them out as we went along. Even had some keychains, not cheap!, and gave some away. I’m going alone come May this year and plan on doing it again! These are great ideas! Thank you for sharing, i’m pinning them on my Disney board. Also you can get your kids to hand out things so it will not come from the creepy adult, ha! I guess I came off as creepy adult. Wasn’t and won’t be blessed with kids, so if people didn’t want something from me, someone else did. We call our week at Disney: “The Week of 1,000 Thank Yous” and challenge the six of us (Mom, Dad and four kids) to give sincere thanks to 1,000 people over the course of the week. We have found that 1,000 Thank Yous easily translates into at least 2,000 smiles. My wife and I were at Wolf Gang Pucks sitting near a very young couple (Probably 19 years old) they ordered a soup which they shared. Then checked their wallet and ordered one entre which they shared. (Young LOVE) Well the look on their face was priceless when we ordered them 2 very fancy desserts. It was as much of a treat to give as it was for them to receive. Love this article and the great stories of RAK. I am inspired to think of ways to share kindness during our trip in a couple of months. Thank you! Fastpass+ took away another popular random act of kindness… passing along unused Fastpasses. In general, I think it’s a good idea not to give gifts to other people’s children. Unfortunately, we live in a scary world, and it could easily make people concerned. Now, if you were a family, and your child wanted to give something to another child, that I think would be much better. But an adult giving things to another person’s child is a little on the creepy side. An idea is to ask the parent’s permission before handing out the gift. My children have been on the receiving end of rak at a national park and I appreciated being asked if it was ok first. The way we discovered to avoid appearance of creepiness, at least with balloons, was to pay the balloon CM for several balloons, and just ask him to give them away…free balloons, no creepy factor..
Now I did ask permission if the parents. Everything I gave was sealed but the glow bracelets. Tgey were in packs. 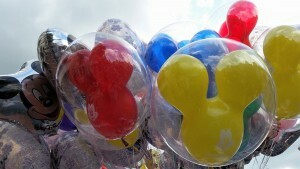 Great article – we had bought our 2.5 year old a mickey ears balloon on our recent trip which he loved. We were flying back home to the UK so told him on the last day that we wouldn’t be able to bring it with us to the airport and maybe he could give it to someone else to enjoy. So we took it with us into Magic Kingdom for our final day and on the bus back to the hotel got chatting to a little girl and her dad, my son whispered to me that he wanted to give her the balloon. So I asked her dad if she would like it and they both looked so thrilled and my son was so pleased with himself! It was such a lovely way to end an amazing trip and my son kept telling everyone when he got home about how he gave a little girl his balloon. It was just a little moment that we’ll always remember. We buy glow bracelets/necklaces from the dollar store before the trip and have shared them with other kids while waiting for the nighttime shows to begin. I am very interested in spending a week volunteering at GKTW when I turn 50 in a few years. Would LOVE to see an article about your experience. We were dining at Victoria’s and Alberts in Victoria’s room for a special occasion. A Naval officer and his wife came after we did. I overheard that they were celebrating an anniversary after he had returned from active duty abroad. My husband and I bought their dinner (anonymously). I heard the officer say, “See, I told you people really do care.” All I could do not to drop tears in my dessert. I cherish this memory. I just love your list of so many possible RAK…on our recent trip we were wearing our Anniversary buttons, and the response was almost overwhelming…both CM and other guests were so wonderful with the Happy Anniversary wishes. It was fun to give back a little with the balloons. Wish I had known about the Cast Member Fanatic cards. And it was always fun to take photos for other folks, as they often did for us. I really like the idea of anonymously leaving stuffed toys on unattended strollers; might have to stock up before our next trip. So wonderful whenever we can do RAK at disney! We had an extra paper fpp b/c of a ride breakdown, which we weren’t able to use b4 end of day. I found a dad with a few young kiddos, said would you like this anytime fpp for tonight? then lost sight of fam while we were on BTMR. finally found them again, gave the pass, and the dad said to his kiddos- see, I told you that lady wasn’t just saying that! what a great feeling, to see the look on those kiddos faces! No. 9 should be listed first. Unacceptable when able-bodied men plop down on bus or boats while older folks or women holding babies struggle to stand. I’ve seen many times where a woman struggles to hold a child standing on a bus, while adjacent big, healthy, seated, mouth-breathing men just stare into space. I have three sons, and they’ve all learned that they give up their seat for an older person or woman. I brought this up on these boards a couple years ago, and the ensuing debate was embarrassingly long. This should be a no-brainer in a courteous society. 1) Someone helping to carry my food. I don’t know what sorts of plagues they have, so I’d prefer no one but me and my wife be anywhere near our food. 2) Taking leftover snacks/water/etc. If I don’t know where this stuff came from, and what has happened to it since it left the store, I want no part of it. The simple act of someone with C.Diff touching a bottle of water and leaving spores on it that then contaminate me isn’t something I’m willing to risk.